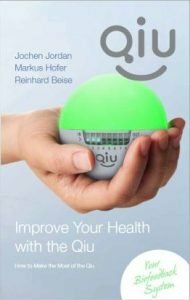 The Qiu is a biofeedback device for a systematic relaxation training developed by German medical doctors. It does not require participation in a training course. It is effective from the first usage session and aims directly towards the health. The biofeedback device Qiu achieves this by strengthening the parasympathetic nervous system. The parasympathetic nervous system brings calmness and relaxation into the body and therefore boosts health strongly. (See also the Qiu book “Improve Your Health with the Qiu“). Who will benefit from the Qiu training? 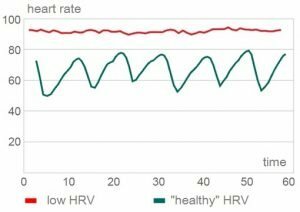 A low heart rate variability (HRV) indicates a significantly increased health risk. An improvement of HRV by biofeedback training with the biofeedback device Qiu is therefore a new approach in medicine for the prevention and therapy support of common diseases (cardiovascular diseases, hypertension, diabetes, depression, etc.). The training with the biofeedback device Qiu strengthens the emotional balance and the performance. For this reason, the Qiu is also successfully used in top sports and coaching. How to use the Qiu? For the training, the Qiu is placed in the hand. With its built-in optical pulse sensor, the biofeedback device measures the pulse at the hand or a finger and calculates the heart rate variability (HRV). 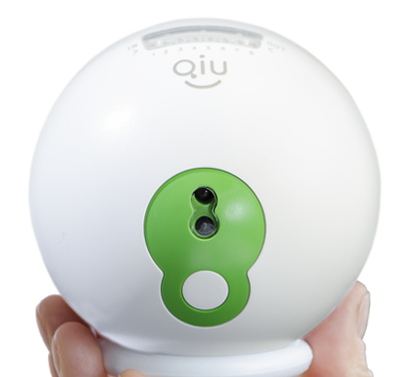 Immediately after the Qiu has detected and analyzed your pulse, the biofeedback device displays your biofeedback by a red or a green light. Individually adjustable, blue LEDs signal you a relaxing breathing frequency, what helps to increase your HRV. A higher HRV is immediately reflected by a positive (green) biofeedback light. This triggers all the conscious and unconscious adaptation processes inside your body and your mind which strengthen the parasympathetic nervous system. The relaxation training with the Qiu can be carried out at any place and at any time – systematically, but also when needed. Via a USB interface, the measured data can be transferred to the cloud via our web platform “myQiu”. In addition, an ear clip can be connected for a hands-free pulse acquisition. Do you want to buy a Qiu? Unity of body and mind? Numerous scientific studies show that there is an relationship between body and mind. Our autonomous nervous system forms the link between body and mind and consists of the parasympathetic (‘inner brake’) and the sympathetic (‘accelerator’) nervous systems. An intact and active parasympathetic nervous system is responsible for inner peace, self-healing and regeneration. It is actually possible to train this ‘inner brake’. The activity of the parasympathetic nervous system can be measured by means of the heart rate variability (HRV); the higher your HRV, the healthier your autonomous nervous system is (see illustration). What does the Qiu cost? 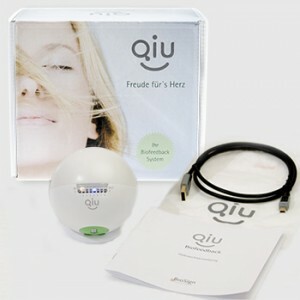 The biofeedback device Qiu costs 259.- € (incl. German VAT. May differ in other countries). How can I get the Qiu? The Biofeedback device Qiu can be obtained via this web page. In order to ensure an optimal result of the application, the Qiu is only given to private individuals if an experienced therapist or coach takes care for the instruction. This therapist or coach is to be specified when ordering. Therapists and coaches can order the Qiu from us. Please let us know if you are a therapist or Coach. My therapist recommended the biofeedback device Qiu, where can I order?